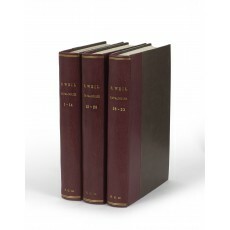 Three volumes (22 cm), bound in recent quarter-morocco (a collector’s binding). - Complete set of Weil’s catalogues in rare original editions and excellent state of preservation (publisher’s wrappers bound in). Born at Ulm in 1891, Ernst Weil was influenced by his cousin, the bookseller Heinrich Eisemann (c. 1889-1972), to collect and eventually to sell early printed books. In 1924, he founded with Hans Taeuber the firm of Taeuber & Weil in Munich; in 1933 he moved his family to London, where he entered into partnership with E.P. Goldschmidt; and in 1943 he commenced bookselling under his own name. Weil died suddenly on 7 March 1965, aged 74. Although modestly produced, his catalogues contain much research and original observation, particularly on hitherto ignored medical and scientific books. 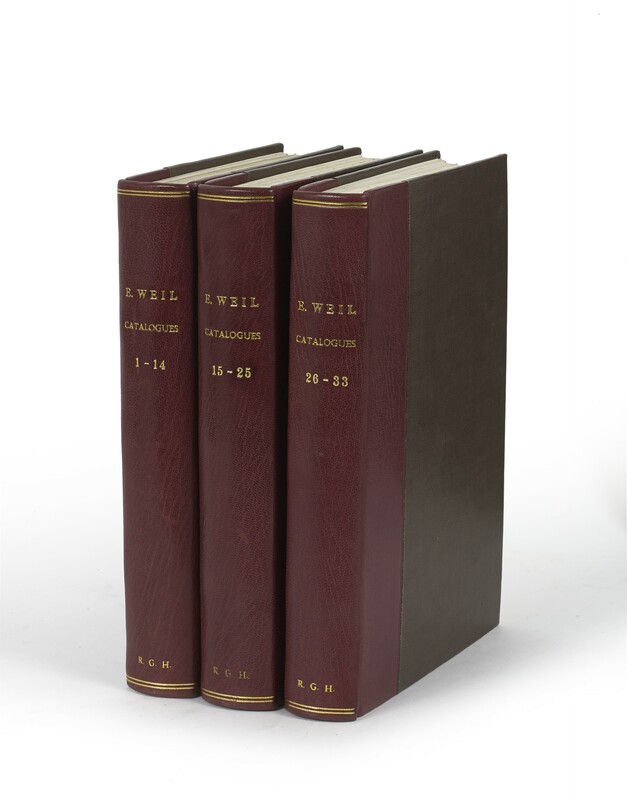 Only one comparable series of Weil’s catalogues (28 only, bound in two volumes) has been seen on the market in recent years, offered in the sale of the E.P. Goldschmidt & Co. Ltd reference library (Christie’s, 8-9 July 1993, lot 645, £528). ¶ Fine set. (22 cm), 26 pp., 3 illustrations. 200 items. Publisher’s printed wrappers. - “April, 1943. Present circumstances have brought about my separation from Messrs. E.P. Goldschmidt & Co. Ltd, from whom I am parting on the best of terms after having held a directorship for ten years. I am opening business at the above address [28, Litchfield Way, London NW11] and will continue to specialise chiefly in books, ancient instruments, prints, etc., which illustrate the History and Progress of Science in all its branches… E. Weil” (notice opposite p.1). (22 cm), (2) 34 pp., 4 illustrations. 353 items. Publisher’s printed wrappers. (22 cm), 34 pp., 6 illustrations. 250 items. Publisher’s printed wrappers. - The four-volume manuscript “Herbarium Pictum” (item 94) with 403 coloured drawings by Andreas Friedrich Happe (1733-1802) is now in the Oak Spring Garden Library; the most expensive book in the catalogue (item 223, £75), Thomas Cantipratensis, Bonum universale de proprietatibus apum (Cologne, c. 1473), is now in the Bodleian Library (shelfmark Dep. d.37; deposited by the entomologist R.W. Lloyd, in 1944). (22 cm), 36 (2) pp., 4 illustrations. 269 items. Publisher’s printed wrappers. - The section on “Photography” features Henry Fox Talbots’ Pencil of Nature (1844-1846), with 18 calotypes in their original wrappers (item 257, £45); and Sun Pictures in Scotland (1845), with 23 calotypes in original cloth binding (item 258, £36). (22 cm), 40 (2) pp., 12 illustrations. 297 items. Publisher’s printed wrappers. - Includes De Thou’s copy of Vesalius’ China-Root Epistle (item 273); this had appeared in E.P. Goldschmidt’s Catalogue 17 (1929) and in Maggs Bros’s Catalogue 582 (1933). (22 cm), 40 pp., 5 illustrations. 293 items. Publisher’s printed wrappers. - Features a cast silver plaque (312 grains) depicting the voyage of Sir Francis Drake by Michael Mercator, of which nine specimens are known to survive. (22 cm), 40 (2) pp., 14 illustrations. 195 items. Publisher’s printed wrappers. - Includes photographs by Fox Talbot (from Abbey House, Malmesbury; item 71) and D.O. Hill (items 74-83), and two large collections of photographs, one of the Crimean War (by James Robertson, ex-Sir William Howard Russell; item 85), the other of the Indian Mutiny (by Felice Beato, item 86). (22 cm), 34 (2) pp., 3 illustrations. 303 items. Publisher’s printed wrappers. (22 cm), 54 (2) pp., 9 illustrations. 322 items. Publisher’s printed wrappers. - Includes (item 1) an English Barber-Surgeon’s manuscript of 1550 now in the Cushing / Whitney Medical Library, Yale University; and (item 5) a XVth century manuscript of works of Nicolaus Salernitanus, sold to Denis Duveen, thence Paul Mellon, and now in the Beinecke Library, Yale University, Mellon Ms 15. (22 cm), 45 (1) pp., 3 illustrations. 364 items. Publisher’s printed wrappers. - Includes preface on “Jean Vauquelin, Seigneur de Yveteaux (1651-1716): a 17th century alchemist”, owner of some alchemical books in the catalogue. (22 cm), 41 (3) pp., illustrations. 132 items. Publisher’s printed wrappers. - Includes a copy of the rare atlas of Wolfgang Lazius (Vienna 1561), sold by Weil to Cyril E. Kenney. (22 cm), 52 (2) pp., illustrations. 392 items. Publisher’s printed wrappers. (22 cm), 40 (2) pp., 2 leaves of plates, illustrations. 147 items. Publisher’s printed wrappers. - Includes (item 7, plates 2 and 3) a pair of anatomical fugitive sheets (Strassburg: Jacob Frölich, 1544). (22 cm), 64 (2) pp., illustrations. 441 items. Publisher’s printed wrappers. - Includes (item 7) the Liechtenstein copy of Johannes Angelus, Astrolabium (Augsburg 1488), containing a paper astrolabe made by an otherwise unknown amateur or scholar, Hanns Herghamer. The astrolabe was later extracted from the book and it is now in Oxford in the Museum of the History of Science, Inv. 91897. (22 cm), 52 (2) pp., illustrations. 237 items; priced. Publisher’s printed wrappers. - Includes (item 1) the Liber amicorum of William Stukeley (1687-1765) with a portrait of Stukeley attributed to Kneller, now Bodleian Library MS. Eng. misc. d. 459 (Clapinson & Rogers 42302); and XVth century manuscript in English of the pseud-Aristotelian Secret of Secrets (item 237), now Toshiyuki Takamiya Collection, MS 38. (22 cm), 48 (2) pp., illustrations. 286 items; priced. Publisher’s printed wrappers. - The “remarkable XVth century codex” mentioned on the title-page is an illustrated “Feuerwerkbuch” (c. 1450) from the Hauslab-Liechtenstein library (item 93). (22 cm), 45 (3) pp., illustrations. 130 items; priced. Publisher’s printed wrappers. (22 cm), 66 (2) pp., illustrations. 375 items; priced. Publisher’s printed wrappers. (22 cm), 64 (2) pp., illustrations. 319 items; priced. Publisher’s printed wrappers. - Includes (pp.3-7) “The Printing History of Copernicus, De Revolutionibus orbium coelestium libri VI, 1543” with bibliographical particulars of copies seen by Weil. At the end of the catalogue is an advertisement for several scientific instruments in Weil’s stock, including a proportional compass of Galileo’s design with the insignia of Vincenzo Gonzaga, duke of Mantua (1564-1612); this was sold in 1952 to David Wheatland, and now is in the Harvard Collection of Historical Scientific Instruments. (22 cm), 66 (2) pp., 2 leaves of plates, illustrations. 262 items; priced. Publisher’s printed wrappers. - Includes (item 67) a copy of the Spiegel menschlicher behaltnuss (Speyer: Peter Drach, about 1495). (22 cm), 59 (1) pp., illustrations. 420 items; priced. Publisher’s printed wrappers. (22 cm), 65 (3) pp., illustrations. 330 items; priced. Publisher’s printed wrappers. (22 cm), 63 (1) pp., illustrations. 340 items; priced. Publisher’s printed wrappers. - Includes books from Schloss Nordkirchen in Westphalia, among them some in gilt-decorated vellum bindings with the insignia or autograph HL (Hermann IV, 1607-1658, Landgrave of Hesse-Rotenburg). Among the scientific instruments is a French armillary sphere dated “about 1470” (item 285, priced £1200). (22 cm), 65 (3) pp., 1 leaf of plates, illustrations. 350 items; priced. Publisher’s printed wrappers. (22 cm), 52 (2) pp., 2 leaves of plates, illustrations. 224 items; priced. Publisher’s printed wrappers. (22 cm), 58 (2) pp., 2 leaves of plates, illustrations. 276 items; priced. Publisher’s printed wrappers. (22 cm), 68 (2) pp., 2 leaves of plates, illustrations. 322 items; priced. Publisher’s printed wrappers. - Includes (lot 94) a manuscript from the Nordkirchen Library of the Venetian cosmographer Gregorius Jordanus, now Houghton Library, Harvard University, MS Typ 471. (22 cm), 64 (2) pp., illustrations. 236 items. Publisher’s printed wrappers. (22 cm), 67 (1) pp., illustrations. 180 items. Publisher’s printed wrappers. - Includes (item 1) a late 16th-century Italian manuscript with 55 anatomical drawings from the Matteo Luigi Canonici (1727-1805) and Rev. Walter Sneyd (1809-1888) libraries, which Weil had recently acquired in Sotheby’s (11 July 1960, lot 131); and a XVth century surgical manuscript of Guglielmo da Saliceto (item 60), acquired in 1956 from H.P. Kraus (Catalogue 80, item 120). (22 cm), 54 (2) pp., illustrations. 438 items. Publisher’s printed wrappers. - Included is a section headed “Photography & Cinematography” (pp.23-26, items, 181-234: “only a small selection from my large stock”), offering inter alia Julia Margaret Cameron’s photograph of Herschel, and calotypes coming from David Octavius Hill’s Edinburgh studio. (22 cm), 70 (2) pp., 2 leaves of plates, illustrations. 357 items. Publisher’s printed wrappers. - Includes (pp.3-4, priced £3000) the “Liber amicorum” of Konrad Gesner, in which more than 200 friends, guests, and acquaintances inscribed their names during the last ten years of his life. The Ms is now in the National Library of Medicine (R.J. Durling, “Conrad Gesner’s Liber amicorum 1555-1565” in Gesnerus, 22, 1965, pp.134-157). (22 cm), 60 (2), pp., illustrations. 346 items. Publisher’s printed wrappers.